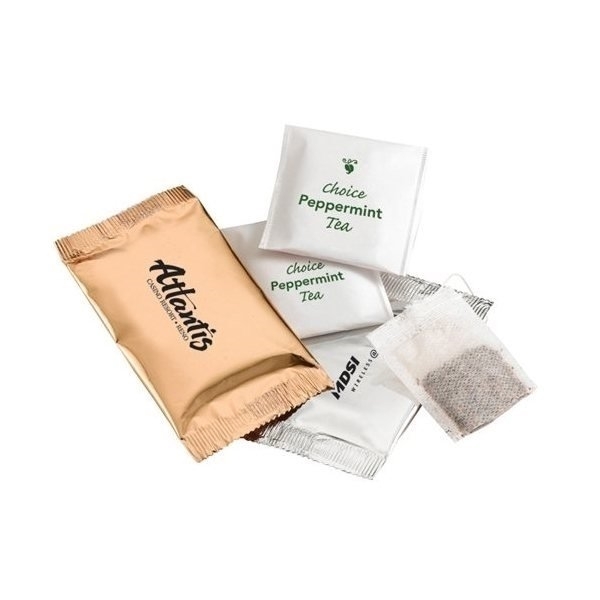 About this Compact Tea Tin:This Tea Tin is an ideal gift to have anyone relax.Four teas of your choice in a customizable large tin.A relaxing promotion for any event.Tea Bags available are Orange Spice, Lemon, Mint, and Pomegranate Green Tea.Special Instructions:Blank items not available. About this Cello Wrapped Tea Bag:Good things come in small packages with our individually cello wrapped Tea bag. Flavor Options: Chamomile Tea, Green Tea, Orange Blend and Peppermint Blend. Bulk packed. About this Coffee Packs:One pot gourmet coffee pack. The coffee packets do not have instructions or ingredients printed on packets.Special Instructions:Warm Weather Shipment: Chocolate products may be damaged by heat during transportation. Refrigerated trucking is available for large shipments (please call). UPS Ground Service is acceptable for 1 to 2 day zones. UPS Blue Service or UPS Red Service is required for shipments into regions that normally take 3 or more shipping days with ground service. About this Instant Hot Chocolate:Our Hottest Item!Carry your name and message home to your clients with these instant handy bags of Hot Chocolate.Special Instructions:Warm Weather Shipment: Chocolate products may be damaged by heat during transportation. Refrigerated trucking is available for large shipments (please call). UPS Ground Service is acceptable for 1 to 2 day zones. UPS Blue Service or UPS Red Service is required for shipments into regions that normally take 3 or more shipping days with ground service. About this Hot Chocolate Single Pack:Individually sealed hot cocoa/chocolate single pack filled with cocoa customized with your logo.Great for tradeshows, giveaways, or events.Special Instructions:Blank items not available.Between the months of April-September we recommend Chocolate, Breath Strips and heat sensitive items be shipped in an insulated carton with cold packs. This adds $14 per carton. It will require 2-Day air shipment. Chocolate and nuts should be stored in a cool dry place. About this Tuscany(TM) Thermal Bottle, Tumbler Journal Ghirardelli(R) Gift Set:Includes the Tuscany™ Thermal Bottle, the Tuscany™ Tumbler, the Tuscany™ Journal, the Venezia™ Folding Bin and two packets of Ghirardelli® Premium Hot Cocoa Mix.Thermal Bottle is 16.9 oz. (499 mL) Stainless Steel with soft faux leather sleeve and Stainless Steel, leak-proof cap keeps drinks hot or cold for hours.Tumbler is 16 oz. (473 mL) insulated stainless steel with black plastic liner and soft faux leather sleeve with splash-resistant SAN Acrylic drink-through lid.Journal features soft faux leather cover, 80 ruled pages, elastic loop closure and bookmark with document pocket on inside back cover.Bin collapsible glazed faux leather and 80 GSM Non-Woven fabric with removable 80 GSM Non-Woven fabric covered cardboard bottom holds box shape.Packets make 6 oz. of hot cocoa. About this Empire(TM) 16 oz Tumbler Ghirardelli(R) Cocoa Gift Set:Includes the Leather-Wrapped Tumbler with two packets of Ghirardelli® Premium Hot Cocoa Mix. Tumbler is 16 oz insulated stainless steel with black plastic liner and splash-resistant SAN acrylic drink-through lid. Bonded leather wrap removes for washing. About this Tuscany(TM) Thermal Bottle Cups Ghirardelli(R) Cocoa Set:Includes the Tuscany™ Thermal Bottle, two Tuscany™ Coffee Cups, the Venezia™ Folding Bin and two packets of Ghirardelli® Premium Hot Cocoa Mix.Thermal Bottle is 16.9 oz. (499 mL) stainless steel with soft faux leather sleeve and stainless steel, leak-proof cap keeps drinks hot or cold for hours.Cups are 10 oz. (295 mL) double-wall stainless steel with bonded leather sleeve, heat-resistant Polypropylene handle. Leather sleeve removes for washing.Bin collapsible glazed faux leather and 80 GSM Non-Woven fabric with removable 80 GSM Non-Woven fabric covered cardboard bottom holds box shape.Packets make 6 oz. of hot cocoa. About this Tuscany(TM) Thermos Ghirardelli(R) Deluxe Gift Set:Includes the Tuscany™ Thermos with five packets of Ghirardelli® Premium Hot Cocoa Mix and five squares of Ghirardelli® Chocolate. 16.9 oz stainless steel thermal bottle with soft faux leather sleeve and stainless steel, leak-proof cap keeps drinks hot or cold for hours. Sleeve removes for washing. About this Empire(TM) Tumbler Godiva(R) Deluxe Gift Set:Includes the Leather-Wrapped Tumbler with Godiva® Hot Cocoa Mix and package of 4 Godiva® Signature Biscuits in a magnetic-closure gift box. Tumbler is 16 oz insulated stainless steel with black plastic liner, splash resistant SAN acrylic drink-through lid, and bonded leather wrap that removes for washing. Includes four packets of hot cocoa mix. Each packet makes 8 oz. About this Tuscany(TM) Tumbler Godiva(R) Deluxe Gift Set:Includes Tuscany™ Tumbler with four packets of Godiva® hot cocoa mix and one package of four Godiva® Signature Biscuits. 16 oz insulated stainless steel tumbler with black plastic liner and soft faux leather sleeve with splash-resistant SAN acrylic drink-through lid. Sleeve removes for washing. About this Tea Gift Box:This gorgeous box of tea is an ideal gift to have anyone relax.Tea bag flavors include a mixture of Orange Spice, Lemon, Mint, and Pomegranate Green Tea finished with a customizable colored ribbon.Flavor substitutions are sometimes necessary.A relaxing promotion for any event.Gift box includes 6 tea bags.Special Instructions:Blank items not available. About this Large Tea Tin:This Large Tea Tin is an ideal gift to have anyone relax.Six teas of your choice in a customizable tin.A relaxing promotion for any event.Tea Bags available are Orange Spice, Lemon Mint and Pomegranate Green Tea.Special Instructions:Blank items not available. About this Coffee Box:Fresh ground coffee to perfection.This specialty coffee is a crowd pleaser.Your get four bags of .75 oz each of the perfectcoffee inside a heat sealed foil bag.The bags are packaged in a customized gourgeous box with your message. Special Instructions:Blank items not available. About this Custom Coffee Box 4- Pack:Place your design on this 4 pack coffee box and give a shot of energy to your brand. Mix of coffee flavors based on inventory and freshness. This single use individual coffee cup is the original size and is not compatible with the newer 2.0 large size machines. Great promotional product value.Special Instructions:Blank items not available. About this Tea Taster Mug:Stoneware Mug with four assorted tea bags. Tea bag flavors are Orange Spice, Lemon, Mint, and Pomegranate Green Tea.Special Instructions:Blank items not available. About this Instant Iced Tea:Carry your name and message home to your clients with these instant handy bags of Iced Tea. Iced Tea is sweetened with lemon. About this Coffee Mug w / Coffee Pack:Here's a thoughtful pairing of items, certain to be savored and then used repeatedly. One pot Gourmet Coffee Packages tuck into high quality ceramic mugs. Each emblazoned with your custom printed logo or message. Hand wash for mugs is recommended.Mug is Microwaveable.Wrapper available in Gold or Silver. Hand wash only. Imprint lifespan will decrease if put into dishwasher. Special Instructions:Warm Weather Shipment: Chocolate products may be damaged by heat during transportation. Refrigerated trucking is available for large shipments (please call). UPS Ground Service is acceptable for 1 to 2 day zones. UPS Blue Service or UPS Red Service is required for shipments into regions that normally take 3 or more shipping days with ground service. About this 4 oz of Ground Coffee:This specialty coffee is a real crowd pleaser.4 ounces of freshly ground gourmet coffee in a heat sealed foil bag.Customize with a Hot Stamp or greeting card with bow attached.Special Instructions:Blank items not available. About this Custom Coffee Box 8- Pack:Place your design on this 8 pack coffee box and give a shot of energy to your brand. Mix of coffee flavors based on inventory and freshness.This single use individual coffee cup is the original size and is not compatible with the newer 2.0 large size machines. Great promotional product value.Special Instructions:Blank items not available. About this Tea Bags in Sleeve:Deliver your Logo on TeaElopes!2 Tea Bags; Lipton Regular Tea or Decaf Lipton Tea. Silver dispenser wrapped with an imprinted envelope. Bulk packaging. About this Click n Sip Gleam 13 oz Tumbler Ghirardelli(R) Cocoa Set:Includes the exclusive Click 'n Sip Gleam Tumbler with two packets of Ghirardelli® Premium Hot Cocoa Mix.13 oz. (384 mL) double-wall vacuum flask tumbler with 201 Stainless Steel exterior and 304 Stainless Steel lining – BPA free.Tumbler features push button, screw-on drink-through lid with silicone gaskets, slip-resistant rubber bottom.Keeps beverages hot or cold for hours.Hand-wash only. Not dishwasher safe or microwaveable.Each packet of Ghirardelli® hot cocoa yields one serving (approx. 12 oz. / 355 mL) and includes directions, nutrition facts and ingredients on back. About this Empire(TM) Thermos Cups Ghirardelli(R) Cocoa Set:Includes the Empire™ Thermos, two Empire™ Coffee Cups, the Venezia™ Folding Bin and two packets of Ghirardelli® Premium Hot Cocoa Mix. Thermos features richly-textured leather with top and bottom stitched accents and a brushed stainless steel finish, leak-proof cap and holds .5 liters/16.9 ounces. Cups are 10 oz double-wall stainless steel with bonded leather sleeve, heat-resistant polypropylene handle. Leather sleeve removes for washing. Collapsible bin features glazed faux leather and 80 GSM non-woven fabric with removable 80 GSM non-woven fabric covered cardboard bottom that holds box shape. Packets make 6 oz of hot cocoa. About this Tuscany(TM) Tumblers Journal, Ghirardelli(R) Cocoa Set:Includes two Tuscany™ Tumblers, the Tuscany™ Journal, the Venezia™ Folding Bin and two packets of Ghirardelli® Premium Hot Cocoa Mix. Tumblers are 16 oz.insulated stainless steel with black plastic liner and soft faux leather sleeve with splash-resistant SAN acrylic drink-through lid. Journal features soft faux leather cover, 80 ruled pages, elastic loop closure and bookmark with document pocket on inside back cover. Bin collapsible glazed faux leather and 80GSM non-woven fabric with removable 80 GSM non-woven fabric covered cardboard bottom holds box shape. Packets make 6 oz.of hot cocoa. About this Tuscany(TM) Tumbler Thermal Bottle Decadent Cocoa Set:Includes the Tuscany™ Thermal Bottle and the Tuscany™ Tumbler with hot cocoa mix and a mini whisk.Thermal Bottle is 16.9 oz. (499 mL) Stainless Steel with soft faux Leather sleeve and Stainless Steel, leak-proof cap keeps drinks hot or cold for hours.Tumbler is 16 oz. (473 mL) insulated Stainless Steel with black Plastic liner and soft faux Leather sleeve with splash-resistant SAN Acrylic drink-through lid.Mix makes 36 oz. of hot cocoa. About this Tuscany(TM) 16 oz Tumbler Ghirardelli(R) Cocoa Gift Set:Tumbler is 16 oz insulated stainless steel with black plastic liner and soft faux leather sleeve with splash-resistant SAN acrylic drink-through lid. Includes the Tuscany™ Tumbler with two packets of Ghirardelli® Premium Hot Cocoa Mix. Packet makes 6 oz of hot cocoa. About this Empire(TM) 16 oz Tumblers Decadent Cocoa Gift Set:Includes two Empire™ Tumblers with hot cocoa mix and a mini whisk. Tumblers are 16 oz insulated stainless steel with black plastic liner and bonded leather sleeve with splash-resistant SAN acrylic drink-through lid. Mix makes 36 oz of hot cocoa. About this Tuscany(TM) 16 oz Tumblers Decadent Cocoa Gift Set:Includes two Tuscany™ Tumblers with hot cocoa mix and a mini whisk. Tumblers are 16 oz insulated stainless steel with black plastic liner and soft faux leather sleeve with splash-resistant SAN acrylic drink-through lid. Mix makes 36 oz of hot cocoa. About this Empire(TM) 16.9 oz Tumbler Thermos Decadent Cocoa Gift Set:Includes the Empire™ Thermos, the Empire™ Tumbler with hot cocoa mix and a mini whisk. Thermos is 16.9 oz stainless steel with bonded leather sleeve and stainless steel, leak-proof cap keeps drinks hot or cold for hours. Tumbler is 16 oz insulated stainless steel with black plastic liner and bonded leather sleeve with splash-resistant SAN acrylic drink-through lid. Mix makes 36 oz of hot cocoa. About this Tuscany(TM) Thermos Cups Coffee Set:Includes the Tuscany™ Thermos, two Tuscany™ Coffee Cups, the Venezia™ Folding Bin, two rock candy stirrers and three packs of Boca Java® Artisanal coffee. 16.9 oz stainless steel thermal bottle with soft faux leather sleeve and stainless steel, leak-proof cap keeps drinks hot or cold for hours. Cups are 10 oz double-wall stainless steel with soft faux leather sleeve, heat-resistant polypropylene handle. Leather sleeve removes for washing. Collapsible bin made of glazed faux leather and 80 GSM non-woven fabric with removable 80 GSM non-woven fabric covered cardboard bottom holds box shape. Coffee packets contain 2 oz that brew one full 8-cup pot (each). About this Empire(TM) Thermos, Cups Coffee Set:Includes the Empire™ Thermos, two Empire™ Coffee Cups, the Venezia™ Folding Bin, two rock candy stirrers and three packs of Boca Java® Artisanal coffee. 16.9 oz stainless steel thermal bottle with richly-textured leather top and bottom stitched accents and leak-proof cap that keeps drinks hot or cold for hours. Cups are 10 oz double-wall stainless steel with bonded leather sleeve, heat-resistant polypropylene handle. Leather sleeve removes for washing. Hand wash only. Not dishwasher safe or microwaveable. Collapsible bin made of glazed faux leather and 80 GSM non-woven fabric with removable 80 GSM non-woven fabric covered cardboard bottom holds box shape. Coffee packets contain 2 oz that brew one full 8-cup pot (each). About this Casablanca(TM) Thermos, Cups Boca Java(R) Coffee Set:Includes the Casablanca™ Thermos, two Casablanca™ Coffee Cups, the Venezia™ Folding Bin, two rock candy stirrers and three packs of Boca Java® Artisanal coffee. 16.9 oz stainless steel thermal bottle with cork textured sleeve with natural weathered look and stainless steel, leak-proof cap keeps drinks hot or cold for hours. Cups are 10 oz double-wall stainless steel with cork textured sleeve with natural weathered look, heat-resistant polypropylene handle. Leather sleeve removes for washing Collapsible bin made of glazed faux leather and 80 GSM non-woven fabric with removable 80 GSM non-woven fabric covered cardboard bottom holds box shape. Coffee packets contain 2 oz that brew one full 8-cup pot (each). About this Boca Java(R) Gift Set:Features Boca Java® Coffee, Hot Chocolate, two rock candy stirrers and Venezia™ Folding Bin. Collapsible bin made from glazed faux leather and 80 GSM non-woven fabric with removable 80 GSM non-woven fabric covered cardboard bottom that holds box shape. Coffee packets contain 2 oz that brew one full 8-cup pot (each). About this Deluxe Travel Mug Gift Tray:Gift tray stuffed with drinkware products.Two 16 oz bottles.Gourmet coffee and tea.Two bags of hot chocolate. About this Deluxe Travel Mug Gift Basket:Gift basket stuffed with drinkware products.Two 16 oz bottles.Gourmet coffee and tea.Two bags of hot chocolate. Thank you Ellie, Mitch and Hope! We're happy to read your positive reviews on our promotional Compact Tea Tin. Tea is popular with many customers! You could never go wrong with coffee or teas. They are always popular at dinner events or conferences. Give your customers the Compact Tea Tin they'll love to drink. This Tea Tin is an ideal gift to have anyone relax. Four teas of your choice in a customizable large tin. A relaxing promotion for any event. Tea Bags available are Orange Spice, Lemon, Mint, and Pomegranate Green Tea. Thank you Dylan and Kaylee for your reviews! We're happy to read your positive feeback on our promotional Cello Wrapped Tea Bag! This item is a top seller in this category for its professional look and delicious taste. Our Cello Wrapped Tea Bag is perfect for luncheons, dinner events, conferences, ceremonies, meetings, and more! Giving your customers tea will allow them to listen comfortably to your event speakers. Flavor Options: Chamomile Tea, Green Tea, Lipton Regular, Lipton Decafe, Orange Blend and Peppermint Blend. Thank you Layla and Alexis for your reviews on our promotional Instant Hot Chocolate! It's a top seller in our coffee and tea category. Yes, Instant Hot Chocolate is found in this category, and is one of the most popular products. This delicious promotional item will be a hit at your next event! In our promotional coffee & tea selection, you'll find the perfect combo that will keep your customers awake! Coffee and tea are a customer's favorite! We have promotional thermos gift sets, instant hot chocolates, tea bags, cocoa gift sets, pretzels gift sets, coffee packs, coffee mugs with coffee pack, tea bags in sleeve, and more! Create your own personalize coffee and tea for your customers! Gift sets are a favorite, you won't want to miss out on these favorites! Promotional coffee & tea are great for all the coffee and tea lovers! You could never go wrong with either or at an office or school event! Look through our selection of promotional coffee & tea. Shop here! Here at AnyPromo, we want to make sure your promotional products are a success at your event! No matter what event it is, we are here to help you find what best fits your marketing needs. Coffee and tea products are perfect for rewarding your employees and customers. They also make a great gift set for your special customers. These products are great to give year-round, but are always popular during winter season! We have different types of promotional coffee and tea available in our selection. Make your customer or employee's day with our promotional coffee and tea products. Below you’ll find a list of some of our trending promotional coffee & tea. Every item is available and waiting for you to order. Promotional coffee and tea products are perfect for coffee and tea lovers! Get their day going with our promotional coffee and tea. Have any questions regarding our promotional coffee and tea selection? Live chat with one of our customer service representatives to help answer all your questions! Our featured list of coffee and tea are trending in this category. Don't miss out on this fun item to giveaway!